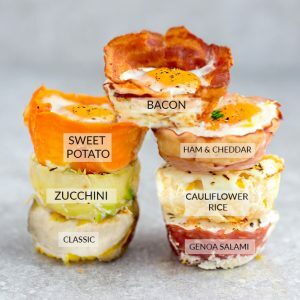 Baked Egg Cups - 9 Ways are the perfect low carb and protein packed breakfast. Best of all, they are super simple to customize and come together in less than 30 minutes! Line the bottom and sides of each muffin tin with meat or veggie slices of your choice - feel free to mix and match or make all the egg cups the same. Crack an egg into each muffin tin. Season with salt and pepper. Add optional toppings.